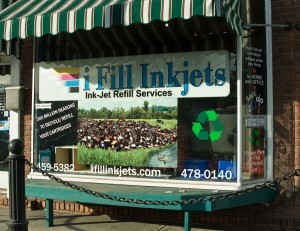 Toner & inkjet cartridge refill services: an alternative to the high cost of printer ink. The service provides a recycling option that saves oil usage and landfill space while giving businesses and consumers a reliable, quality refill with a cost saving. All refills are guaranteed. Many cartridges are refilled within an hour. To date, over 350,000 cartridges have been refilled/saved. This roughly translates to about 80 full grocery carts of empty cartridges, about 6,000 gallons of oil and consumers’ saving over $3.5 million. What separates iFillInkjets from the competition? Trained technicians manually fill & troubleshoot each cartridge with care. These technicians respond to customer inquiries throughout the process. A broad array of ink (over 100 formulations) is utilized to match the right ink to the right cartridge.